Captured for posterity in a dome! When you’re looking for something truly unique for your home, there’s really nothing more fitting that a Memorabilia Dome. If you’re anything like me you’ll have lots of different trinkets dotted around your home relating to special memories and events in your life. It could be things from your wedding day, the birth of your children, a treasured pet or a landmark anniversary. We’ve recently completed several special commissions for Memorabilia Domes on behalf of customers across the globe and despite each being completely unique, they all share the styling and characteristics of the Holt Harrison design aesthetic. 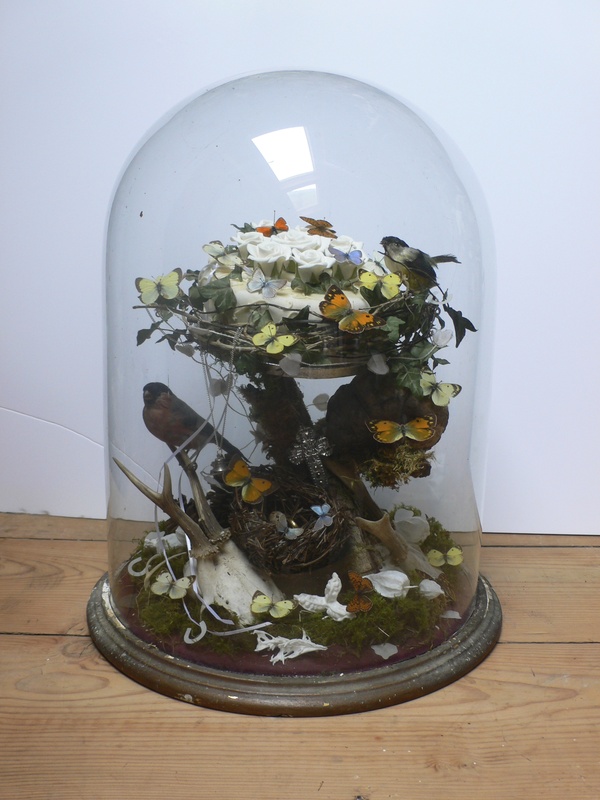 Personal items collaborate with natural adornments such as minature bonsai, taxidermy, vintage silk flowers, reclaimed adornments, butterflies and more; all housed within antique glass domes of varying sizes. Due to the highly personal nature of each commission, we are not able to showcase these pieces here, but I was recently inspired to create one for Egford House (**this will link to Telegraph piece in separate blog**) celebrating my marriage to Harry 6 years ago. At last, I could rescue and re-invigorate a tier from our wedding cake that had been stored in the attic alongside various trinkets from our special day. Incorporated within an antique French glass dome, the tier from our wedding cake forms the central focus of the piece sitting within a birds nest, held atop a bonsai covered with moss gathered from our local wood. Two beautiful song birds and a selection of antique butterflies signified the natural beauty of our wedding venue in the heart of Somerset, and act as a constant reminder of the sounds and colour that surrounded us on the day. Roedeer skulls surround a further birds nest featuring eggs, reflecting our lifelong commitment to each other, and porcelain seed pods are scattered alongside confetti and ribbons from our big day. The porcelain seeds pods were selected to highlight the fragile nature of life and how love can grow from the smallest of seeds into something spectacular. A gold ring, silver bell and crucifix relate to items given to us by friends on the day and have been strategically placed to catch the eye and draw you in, ensuring a new discovery every time visitors to the house look upon the dome. Of course, everyone has a different story to tell. We’ll create a Holt Harrison Memorabilia Dome that will inspire, captivate and celebrate special moments in your life. Even if you don’t want a personalised dome, you can select one of our pieces from our Dome Collection where each creation is unique; featuring anything from seascapes to vintage dolls eyes!